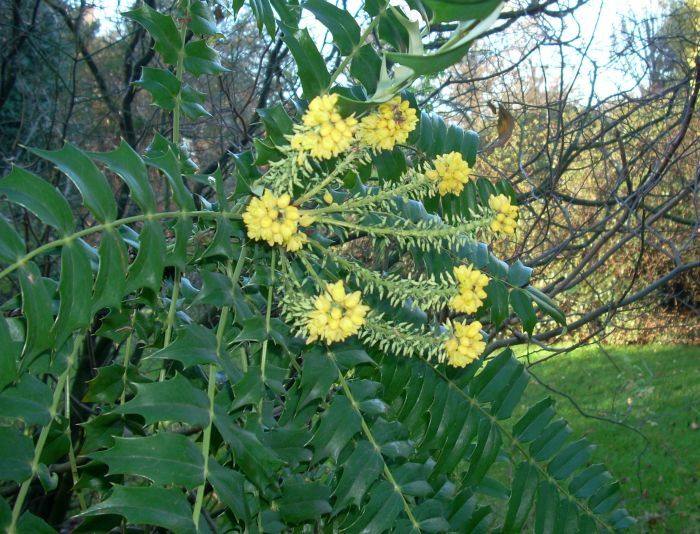 Awarded a preliminary commendation from the Royal Horticultural Society in 1957, followed by an Award of Garden Merit and a First Class Certificate, Mahonia x media ‘Charity’ is an evergreen flowering shrub that provides colour to the garden in the lead-up to Christmas. The leaves can be composed of up to 19 glossy green, spiny leaflets depending on the health of the plant. It is a vigorous hybrid between the pollen parent M. japonica, from which it inherited the very faint fragrance and the length of the individual racemes, and the seed parent M. lomariifolia, from which it inherited its stature. The upright setting of the flower stalks within the raceme is also present in this parent. 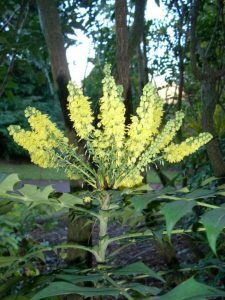 This shrub adds interest to shaded areas, or in spots where a shaft of winter sun will catch these yellow flowers for greatest effect. With age it becomes a leggy specimen, easily reaching four meters. This is soon remedied with a pair of loppers in late March just before growth starts. New growth is produced from pruned shoots which will flower at the seasons end. 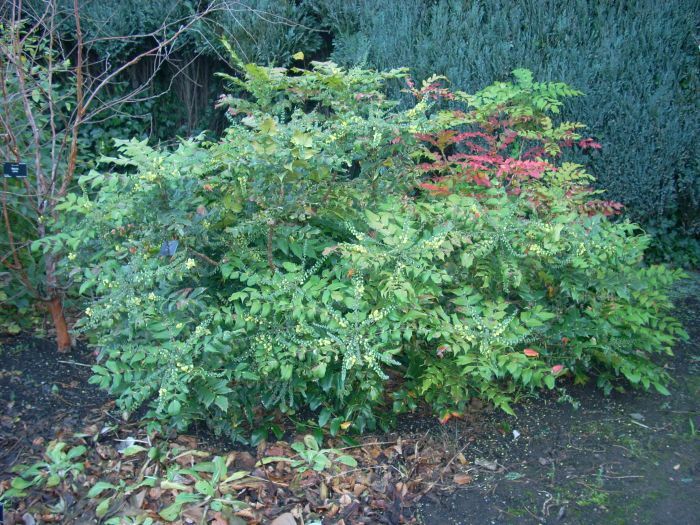 M. japonica is a smaller growing, less vigorous specimen. The racemes have a flattened formation, long and gracefully held. The globular buds are a glaucous green, attached by a short stalk, and open to a light yellow colour and with a hint of fragrance. M. lomariifolia also reaches four meters in height and has long leaves composed of up to 37 leaflets. The flowers are a buttercup yellow and although Bean, in his book Trees and Shrubs Hardy in the British Isles, states they have scent, I could not detect any. M.x media ‘Charity’ in the Demonstration Garden. M. japonica to the south of the Queen Mother Memorial Garden, with another specimen of ‘Charity’ growing nearby. M. lomariifolia in the cultivated area to the north of Inverleith House, very shy to flower and almost over.